Research is not what you think it is. Especially if you think it is something you can't do. Darryl Davies from the department has been explaining that all studies are actually a form of research. and that you can follow a trajectory from undergraduate courses via Final Year Projects into research for a higher degree. You can find his slides here. Rob Hogg from Black Marble came to see us today. He was talking about "Disruptive Development". Rather sadly (writes Rob Miles) I was unable to see all the talk, having another commitment for the first part. However, the fact that when I entered the lecture room everyone was dead quiet and paying close attention means that there must have been some good stuff going on. The basis of Rob's talk was tuServe, a system developed for a UK police force. He was talking about the way in which a brave developer can achieve a step change in the quality of an application, as long as they can convince the customer (who probably wants to stay with the stuff that they know and love) that what they are talking about is possible. I stole the pictures on the right from a case study that Intel have produced about this very successful project. Well worth a read. Thanks to Rob for a great session. · Find out what you actually do when you are doing research, and how to get involved. Hantao Liu explains all. · Joe Stead explains how to take your programs across platform without even noticing. · If you have any inclination to publish video games you should now about PEGI certification and how to effectively design your game for its audience. · Jon Purdy from the Hull Immersive Visualisation Environment gives a demonstration of the technology we have and explains how you can get to use some of it. Rather Useful Seminars are on topics which are not part of the curriculum but are fun and might even be useful. Anyone is welcome to come along. All the seminars will take place at 1:15pm on the given Wednesday, in the locations given. Today it was Raspberry Pi time. I'm trying to remember to make screencasts of all the Rather Useful Seminars from now on. Camtasia makes it really easy. Did a Rather Useful Seminar all about Monogame and XNA today. I took a screencast of the video which you can find above. If you want the sample program code and the slide deck you can find it here. 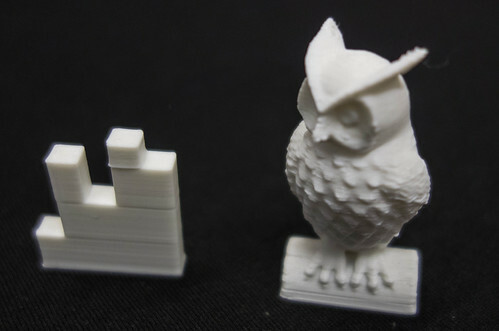 If you are wondering how programs can create 3D objects this seminar will give you some ideas. We are going to look at a couple of things. First off we are going to find out how we can use a C# program to go from a depth map produced by a Kinect sensor to a solid object that can be printed. Then we are going to dive inside a CAD program and write some Python code which will allows us to print the weather forecast as a solid object. Finally we are going to find out how a Fused Deposition Modelling (FDM) printer can be made to print out the designs that we have created. Usual place: Robert Blackburn LTA. Usual time: 1:15 pm. Usual day: Wednesday 22nd of October. 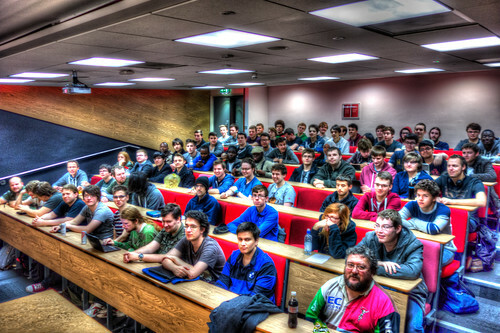 The conference is for students at Hull University who want to find out just what local software development is going on and meet up with the folks doing it. If you are a Second Year you should be looking for internships and summer placements. If you are a Third or Fourth year you should be talking to people with a view to employment. There is a lot going on in Hull and this is how you can become part of it. We are back with a sequence of presentations that are tailored at the professional world. All the presentations are at the same time as usual, 1:15 on Wednesday, but the venue has shifted to Lecture Theatre A on the ground floor of the Robert Blackburn Building. Turns out that Hull is a really exciting place to be just at the moment. With the interest in the area generated by the successful City of Culture bid, high performance fibre optic networking, new startup incubators and lots of other things coming together the future is very interesting. One fascinating local development is the ongoing availability of lots of local information from Hull City Council. This has the potential to drive lots of new and innovative application ideas. John Connelly has been intimately involved with this huge project and will be talking about how the data is becoming available and how you can get involved. We are planning to run a "Three Thing Thing" competition at the very end of this semester where we will be turning everyone loose on data feeds to see what they can come up with. This seminar is a lead in to our Careers and Internships Conference on April 2nd. The event is aimed at any students who are interested in internship and employment opportunities. We've got a lot of employers who are really keen to meet up with students to discuss ways forward. For the conference we expect everyone to be suited up and looking their best. In this session Rob and David will run through tips and tricks to look good in these situations and how to present yourself to the max. You can sign up for the conference (free business cards, info-pack and mug) at this seminar too. We love it when our ex students come back and tell us what they have been up to. Phil Cluff graduated a few years ago and is now Principal Software Engineer & Team Lead, FM Media Services at the BBC. If you want to find out how iPlayer works, how it was built and where it is going then you should come along and see. This is not a Rather Useful Seminar. But we hope it will be more than just Rather Useful. Especially if you are looking for an internship or a job at some point in your future. You might not know this, but Hull turns out to be quite a hotbed of digital based companies who have a healthy appetite for bright young minds. The aim of the conference is to put these two together and get some sparks flying. If you are looking at the upcoming summer and thinking it might be good to get something lucrative going in the form of a paid internship, or you are looking at your upcoming future and wondering just what goes on in these parts, then you must, must come along. We've got loads of local employers coming along, we'll have talks on local industry and where it is going and you'll get a free bunch of business cards to pass out while you are there. And a nice ceramic mug to serve as a memento of the occasion when your life changed direction. This event will start at 1:00 pm on Wednesday 2nd April and run through until around 4:00 pm. We start in LTA with a keynote and presentations before moving upstairs to 312 for a mini-expo. I think Simon learned a lesson today.He learned not to email me and say “I’ve got some great ideas for the Rather Useful Seminar this afternoon about getting your game to market”. I told him I had an even better idea. He could do the seminar. Get something out there. Just do it. Don’t wait for it to be “finished”. Nothing is ever really finished. If you get stuff out there you will get feedback and make your next game even better. The experience of actually getting something approved and in a marketplace is an incredibly valuable one. Set yourself deadlines. Don’t just plan to “Get round to it”. You never will. Tell yourself you are going to ship at the end of November and then do that. Put yourself out there. Like everything else, it is all about networking and who you know. Get yourself business cards. Go to events. Shake hands with folks. Start a blog, get yourself a following and practise your writing styles. There is no such thing as an “Overnight Success”. Minecraft took four years of solid work. Lots of other independent games that came from nowhere actually had a long gestation period and lots of planning behind them. And they were frequently the most recent in a long line of releases that had previously gone nowhere. If something doesn’t work the way you thought it would, see if that makes the gameplay better, and use it if it does. Some games are built on “happy accidents”. Thanks so much to Simon for putting together such a good presentation at such short notice. You can find the slides here. What a great audience to get things wrong in front of…. I did the XNA Rather Useful Seminar today. Slightly enlivened by the fact that I finished the slide deck only a few minutes before the lecture itself. Oh well. Everything worked eventually…..
You can find the slides here. You can find the demos here. This is a slightly processed picture of the audience. It seems that quite a few people have a taste for Pi. We did another Rather Useful Seminar today. It was all about the Raspberry Pi. 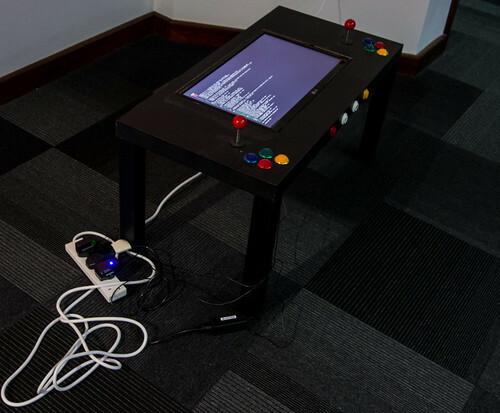 I covered what is, how you use it, a bit about hardware interfacing from Python and then we had a bit of time to look at my Pi Arcade table, which I’m keeping in the department for now. This is the table, showing off its Pi credentials. Normally I run Mame on it. You can find out more about how I built it here. Thanks to a great audience. You can find the slides here. We had a good audience for the first Rather Useful Seminar. Some of them were fresh from a first year lecture and must have been feeling a mite peckish. But they stayed to the end and I hope they enjoyed it. The talk was very similar to the one I did last year, but there was a twist at the end, when I printed the weather forecast as a plastic object. Again, I brought along Una the Ultimaker, and again she behaved herself very well. 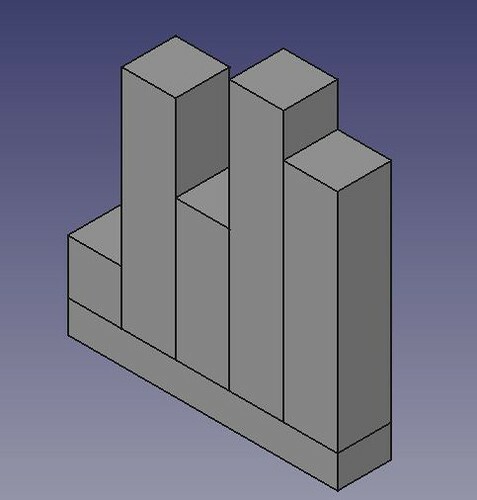 I’ve become quite intrigued with the idea of generating objects from software, and it occurred to me that with the FreeCad tool having a Python interpreter in it, we should be able to do something interesting. I’d no idea how to use Python to read a weather forecast but fortunately Catalin George Festila has done it here. So I took his methods which use the Yahoo weather feed and prints it out and made a few changes. This is the code that he wrote that fetches the weather information from the Yahoo weather service and creates a list of objects that contain a forecast item for five days. The forecast information contains the highest temperature for each day, and that’s what I’m going to use to control the height of each of the columns that I print. The Yahoo zip code for Hull in the UK is UKXX0476. This code fetches the weather forecast data and then finds the largest and smallest temperature values (something which should be familiar to first year students). It then makes a row of five blocks, each of which has a height set by the temperature for that day. I’ve re-written it from the demonstrated code so that the coordinates make a bit more sense. The width and depth values map onto the x and y directions, with height being the z value. The code creates a little plinth and fuses a series of blocks onto the plinth. The length of each block is the temperature for that day. This is the object that was produced by FreeCad. It represents the temperatures 12, 16,14, 17 and 16 degrees, which is the rather chilly forecast for the next few days. I sliced the design using Cura and then, after a bit of kerfuffle I managed to print out the temperature plot. The weather forecast. And a tiny owl. I printed it out really tiny (all of the dimension values above are in mm) but I reckon it came out quite well. I’ve since found a flaw though, in that you can’t tell which way round it is supposed to be read. Of course I could add an arrow or emboss some text to make it easier to use. I must admit that I can’t see a huge demand for physical manifestations of the weather forecast, but I hope it brought home to folks how easy it is to grab information and turn it into something tangible. There is a lot of scope for random patterns and generating objects from mathematical formulae. And, as you can see above, it is very easy to do. I made an offer that if anyone uses Python to make an interesting object I’d be quite happy to print it out for them. You can find the slide deck here. At the end Peter was kind enough to show some videos of his printer in action. You can find out all about the “Richmond” 3D printer at his blog here. We are back with a slightly changed logo (it is now orange) and a packed programme of events for this semester. All the seminars will take place at 1:15pm on the given Wednesday, in Lecture Theatre D in the Robert Blackburn Building. Anyone is free to come along. If you have a burning desire to present on a computing topic Rob Miles would love to hear from you.